The city of Flagstaff, on the Colorado Plateau in Arizona (AZ), is a popular place to visit, en route to the nearby Grand Canyon Village, which stands just 80 miles / 128 km to the north of Flagstaff. 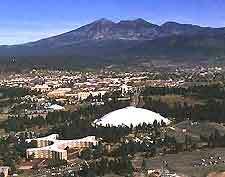 Known for being the largest and liveliest town in the north of Arizona, Flagstaff is located close to the San Francisco Peaks mountain range, between California (CA) and New Mexico (NM). Flagstaff was first settled in the 1870s and is the perfect base for day trips and excursions, with many nearby towns and cities within easy driving distance. These include Williams, which stands just 32 miles / 51 km from Flagstaff, and Phoenix, a three-hour drive from Flagstaff, located around 150 miles / 241 km to the south. Flagstaff also features a major railroad, which dates back to the late 19th century, when it was responsible for much of the town's wealth. The famous Santa Fe Avenue (formerly Route 66) in Flagstaff is lined with many notable, historic buildings and parallels Interstate 40. With noticeably cooler summer weather than many parts of Arizona, Flagstaff's climate is comfortable and appealing, with frequent sunny weather and clear skies. Nicknamed 'Flag' by its locals, Flagstaff contains a good selection of accommodation with a mixture of modern and historical hotels, suitable for all levels. Hotel rates in Flagstaff are good value and offer the most reasonably priced accommodation in the region, with rates rising during the summer. Camping grounds on the outskirts of Flagstaff also provide popular accommodation alternatives. 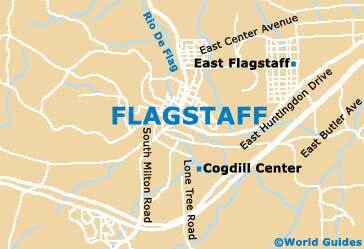 More information about Flagstaff Hotels. Tourism has become the prominent industry in the Flagstaff area and as a direct result, the town offers plenty of things to see and do. Flagstaff's main tourist information office is the Flagstaff Visitor Center on Santa Fe Avenue, located in the historical Amtrak train depot building. Open daily and offering a range of indepth tourism information, including leaflets about prominent tourist attractions, where to stay and eat, popular hiking trails and current events information, look out for the weekly 'Flagstaff Live' magazine, a free local publication with useful entertainment information. Highlights in Flagstaff include a range of popular restaurants throughout the town, three notable national monuments, a renowned museum and the Northern Arizona University (NAU), which supports a lively and colorful community. To the north of Flagstaff, the San Francisco Peaks mountain region is home to the Arizona Snowbowl ski resort on the slopes of Mount Agassiz, a major destination during the winter season, from December to April. Tourist attractions here include 32 scenic trails suitable for both skiers and snowboarders, a ski school, accommodation, views of the Grand Canyon's North Rim, chairlift rides and hiking trails, which are particularly popular in the summer. Flagstaff has many popular tourist attractions worth a visit, including Sunset Crater Volcano Monument - an ancient Flagstaff crater offering outstanding views; Walnut Canyon National Monument - a former Sinagua settlement with cliff homes, which were carved from the rock; Flagstaff's Wupatki National Monument - featuring three exciting trails in stunning countryside; Riordan Mansion State Historic Park - a grand 40-room mansion built more than 100 years ago, with regular guided tours and many period features; Flagstaff's Museum of Northern Arizona - home to an impressive collection of local Indian archaeology and historic artifacts, exhibited in five gallery areas; and the Museum Club (The Zoo) - an entertainment venue where visitors can enjoy a drink and view a stunning collection of preserved animals. 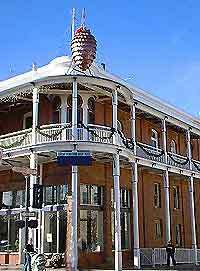 More information about Flagstaff Tourist Attractions and Flagstaff Landmarks.